Back in Newfoundland the trains stopped running in the 80’s, so I’ve never really had a chance to go on one. There was a set of train tracks on the back of our townhouse when I was really young (age 3 and under), and I have a fond memory of my Dad lifting me up onto his shoulders so I could wave to the conductor as the train went by. Ever since then I had a fascination with watching trains go by. I always get excited when I see one up here in Ontario. Well, my train rides to Ottawa is a story to be remembered, that’s for sure. Let me get started. It’s going to be long. Via Rail was having a 50% off all rides and since I’ve never been on a train, I decided to book one (for $177 round trip with the 50% off), and take the stress off me driving up there for 6+ hours. Last Friday, Scott dropped me off at the local train station for me to catch my 6:30am train (I keep wanting to type bus or airplane! I’m not used to going on trains). Off I go! Can you spot me? The first train was pretty old school. I sat in a 4-seater and then realized later it was supposed to be reserved for people traveling in groups of 3 or more. Whoops! 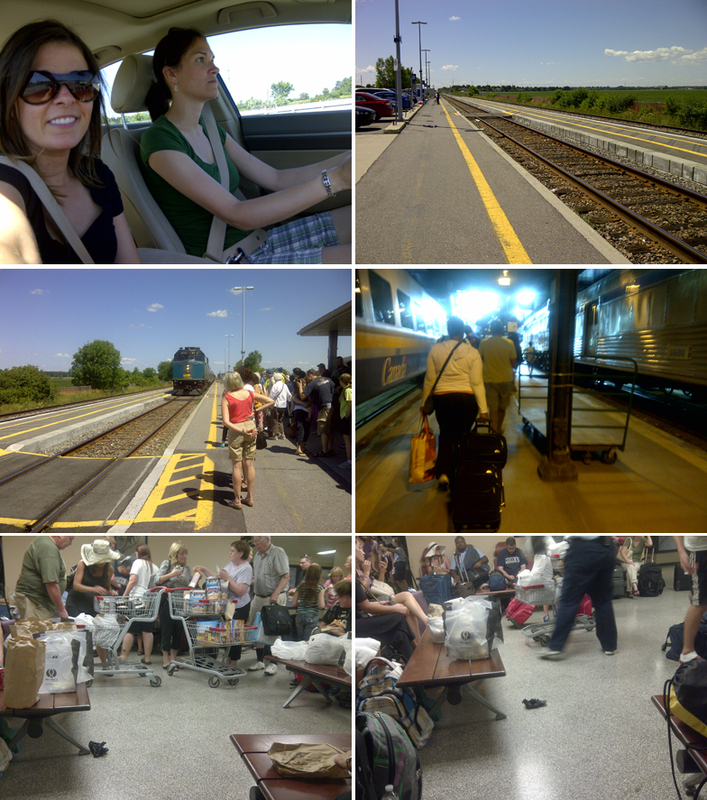 Thankfully the train was empty, and the Via Rail staff were so friendly and probably knew I was new at this. I had my mini suitcase by my side, and the flight attendant put it away for me up at the front where you first step onto the train. I kind of wanted the Engineers to shout out ALL ABOARD!, but that didn’t happen unfortunately. I got off the first train at Union Station in Toronto and followed everyone down the escalators and waited in a lineup for my second train from Toronto-Ottawa. I had no idea why we were lined up down there and not to where our trains were, so I ended up asking the guy ahead of me. Which resulted in a conversation between me and 3 men. One guy was going to a Wedding, the man I was talking to was just heading up (I assume), and another guy was straight from India. It was his very first time in Canada! So that was pretty neat, for him. 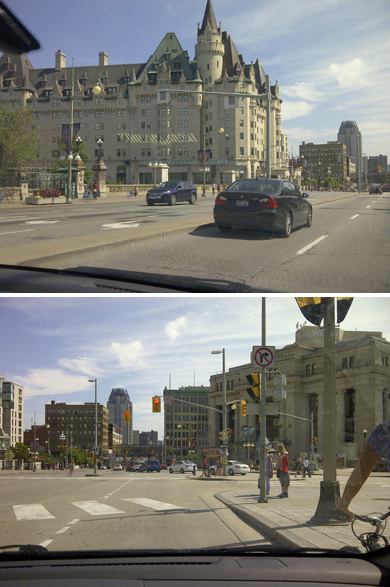 I was so excited to make it to Ottawa! 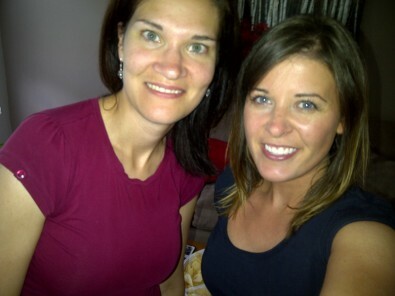 I haven’t really hung out with my best friend from Newfoundland (who now lives in Ottawa) since we both moved here in 2006! 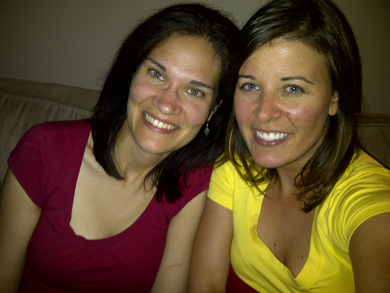 We had a lot of giggling and catching up to do. The Friday night that I arrived was pretty laid back. Jenna’s boyfriend ended up making us some supper, then we had some drinks and a nice evening in, for chit-chatting. 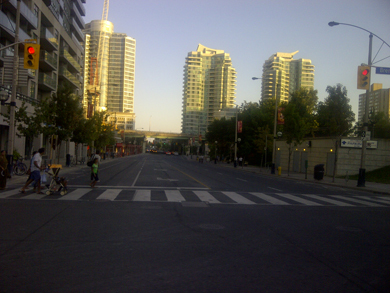 Saturday we got up early and headed to downtown Ottawa. Love the old buildings. 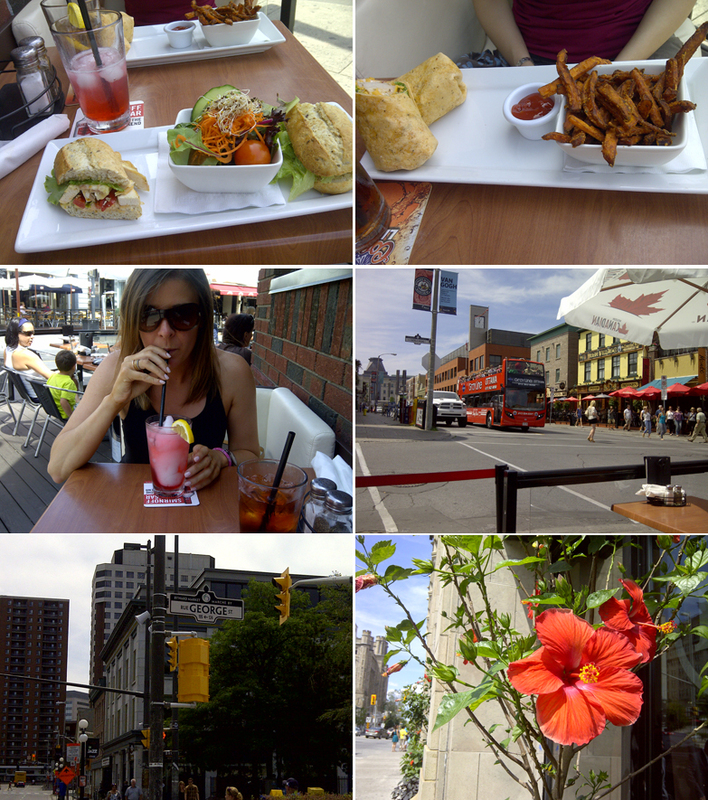 We parked her car, and shopped around the Rideau Centre for a bit. Where I bought some $12.00 jeans from Forever 21. Hey, they fit well — so why not right? 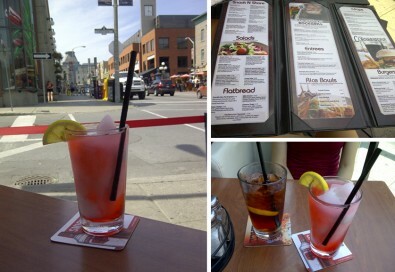 By the time we were done browsing around, we were getting pretty hungry and decided to head to the By Ward Market. I didn’t realize how small the market was — it was literally a block. But they had some vendors set up and I kind of wanted to buy a ring made from a spoon. I should’ve taken a photo of it. 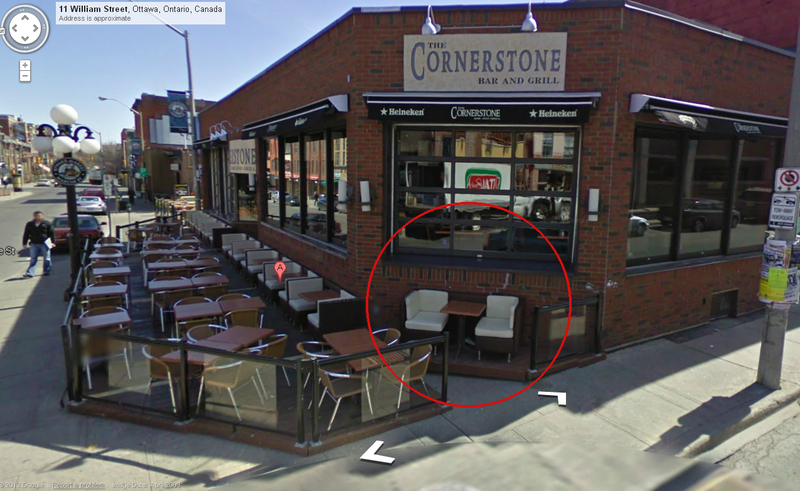 So neat..
Jenna and I headed to the Cornerstone Bar & Grill in the By Ward Market, just because of the comfortable looking patio. Thanks to Google Maps street view for the pic. I circled exactly where we sat! Ha. Oh technology these days. It was such a nice warm day, I was content with just a tank top and shorts on. First up, drinks! They had a new drink menu so I had to choose from there, of course. I got an alcoholic Cherry Lemonade which tasted like a Mr. Freezie! Jenna was driving so she purchased the Iced Tea. I got the Italian Chicken Panini with a garden salad, and Jenna opted for the club wrap with sweet potato fries. 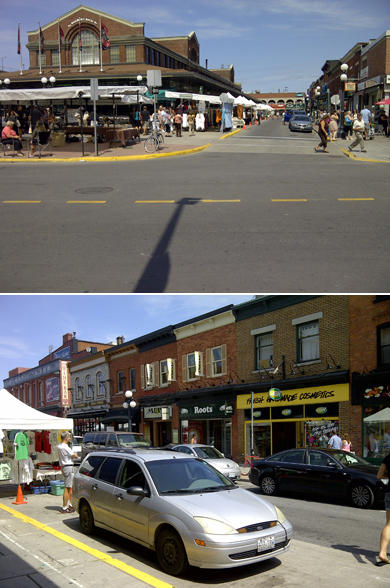 From there we browsed around downtown and went into all sorts of stores. I even spotted a George Street — see above (famous street in Newfoundland for all the bars)! So awesome. Jenna sent me a parcel for my birthday back in May, and it had some home made fudge inside, I liked it so we drove to Penny’s Fudge Factory in Fitzroy Harbour to get more. I don’t know why, since I don’t generally like fudge. But whatev, I bought a whole pound of’er! I then spotted the gelato freezer and bought a mini tub of it, in Hazelnut. Yum, except…not. It wasn’t that good, pretty gritty tasting lol. Totally random story. But I spotted this framed photo and had to take a photo of the photo of Jenna’s cat Tiggs that I took 12 years ago!! I gave Jenna this barn cat 12 years ago, weeks after her 21 year old cat passed away. Crazy right? I didn’t even ask her, or her parents if she wanted one. I showed up with Tigger in a box, and was literally all here’s a cat for you Jenna! lol now that I think of it, it’s like who does that!? That night Jenna and her boyfriend had some people over to the house. But before everyone arrived, Jenna and I had to get some photos in, while we were waiting and drinking out fancy pineapple-tasting drinks! 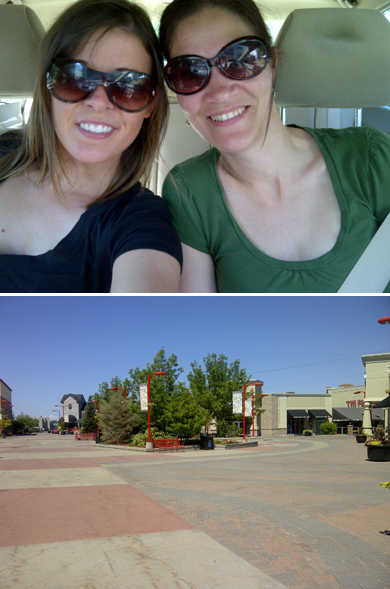 My final morning, we had time to shop around the City Walk in Kanata! Loved the look of this place. It reminded me of my trip to California. Then it was time for my departure. Little did I know that this was going to be a whole day extravaganza as opposed to a relaxing 7hr train ride back home. MOS-ES. 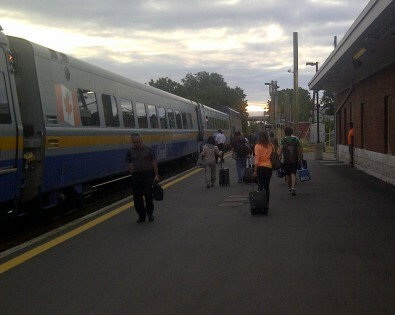 The train ended up getting stuck on the tracks as there was a dispatch signal problem about an hour outside of Ottawa. The train was at a stand still for 1hr45min! It wasn’t the only delay, we had two more after the fact. Thankfully, there was free wifi on board, and regardless of the turbulence (can you call it turbulence if we’re on the ground?) I didn’t have anywhere to that Sunday evening so I wasn’t too upset. 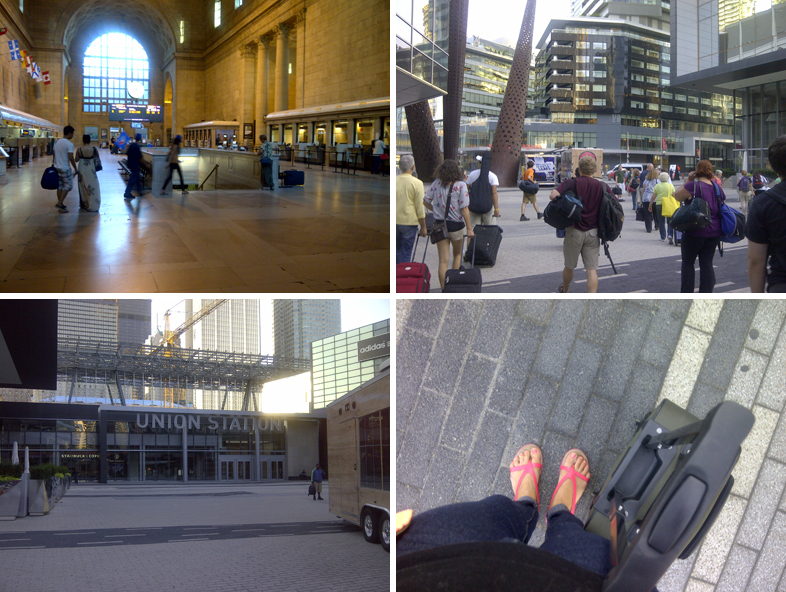 They made everyone on all of the trains get off at Union Station in Toronto once again. We were told to wait in one of the alcove’s until further notice. To my surprise, Via Rail ended up bringing out two shopping carts full of food for all of the passengers! That’s what I call great service. Once supper was finished, we were all lined up outside to get on buses to our final destination. Since the train has a variety of stops, they needed more than one shuttle bus for all the destinations. Thankfully, we went straight from Toronto, to our final stop. I ended up on one of the rickety, very old run down buses as opposed to the fancy limo’s, but I suppose beggars can’t be choosers. I use to always take the early 6am train when I was traveling from Windsor to Aldershot because the odds of something going wrong seemed to be really slim. Whenever I took later trains we would always be delayed and I hated it so much. Nice to know that the wifi is free now, I use to have to pay to use it and it was so unreliable.